​The Cleveland Browns decision to sign embattled running back ​Kareem Hunt is fairly being brought into question. However, this fan theory is out of left field. 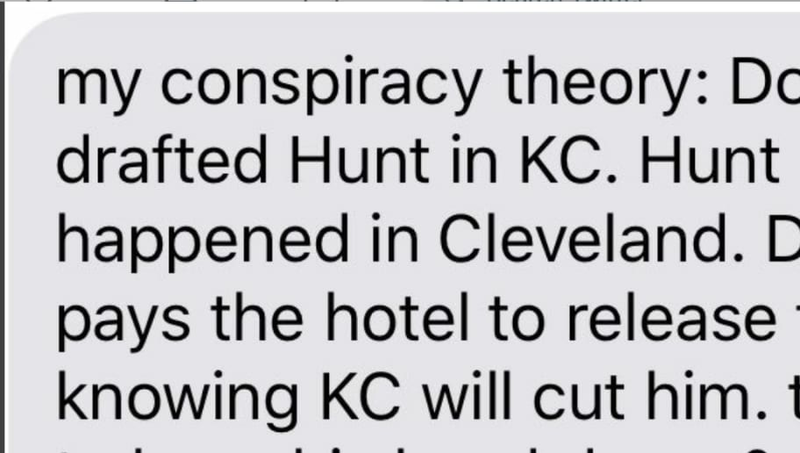 Per Busted Coverage's twitter DMs (a place we can only imagine this happens fairly frequently in), one fan believes ​Browns GM John Dorsey purposely leaked the Hunt fight video in hopes of reuniting with his former Chiefs draftee in Cleveland. Read on as this fan (who clearly has far too much time on his/her hands) connects the imaginary dots. Everyone is happy? Are the Chiefs happy? Is Hunt's victim happy? We're going to go with no. Kansas City would've preferred to keep said video out of the public eye, and Hunt's victim certainly didn't want her name and account of the story questioned by thousands of NFL fans who don't even know her. Next, why would Dorsey risk his entire reputation to land a running back AFTER drafting Nick Chubb and signing Duke Johnson to an extension? Literally none of this makes sense, fam. Oh, you bet it gets worse. This theory's been posted on multiple occasions! Even crazy fans can't be unique in today's social media-driven society.